A first rain drop reflects the serious intentions of the dark clouds above me, I don’t even blink. Okay maybe I increase the throttle input on the cross-drilled aluminium pedal. Pure physics, certainly not quantum, but basic Newton laws explain that above certain speed the airflow and glass windshield will create a deflector that will keep the open cabin dry. In the meantime rain starts pouring, in buckets. I am on an open road and the situation is almost incongruous. Wipers are on full alert, the fat tires gliding over standing water with my horizon saturated with lightning. As I glimpse at the rear seats, there is not a single drop of water on them. If I ever felt like being sheltered in a cocoon, this was my historic moment. 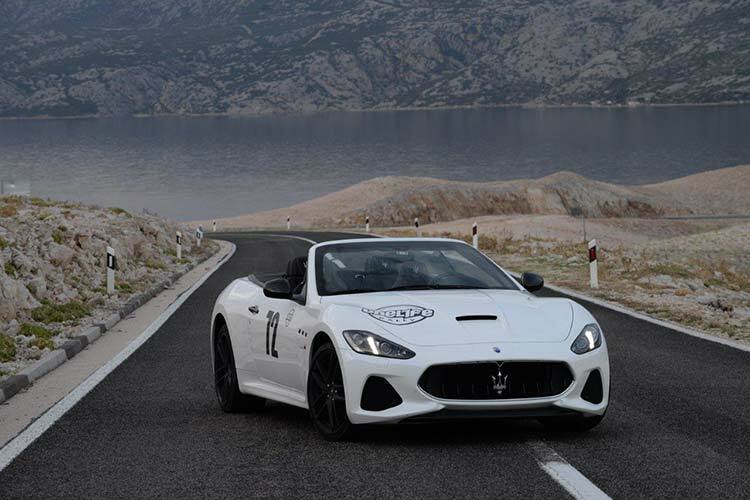 And what a moment in this white new reinterpretation of a Maserati GranCabrio. A decade on the market, with minor changes and tweaks, the silhouette still looks romantically gorgeous. This newest model isn’t a mere make-up powder application, but actually features a restyled front, that includes an octagonal grill, reshaped air intakes and new bumpers. The result is better aerodynamics with the drag coefficient value down to 0,33. If anywhere, this matters on a convertible; less turbulence and whisper like conversations with your co-driver. More changes in the cockpit bring this machine up to date with current market expectations, a huge screen on a restyled central console, and new infotainment system. 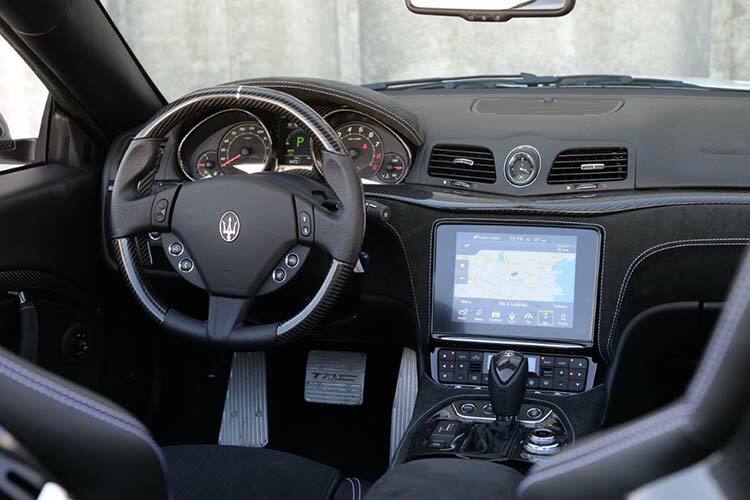 This Maserati can now speak a language compatible with your phone. When I called Davide Kluzer, the PR director of this Modena (Italy) based manufacturer and proposed we take its newest creation to a supercar lifestyle-drive event down the Adriatic Coast, he offered the top of the line model. 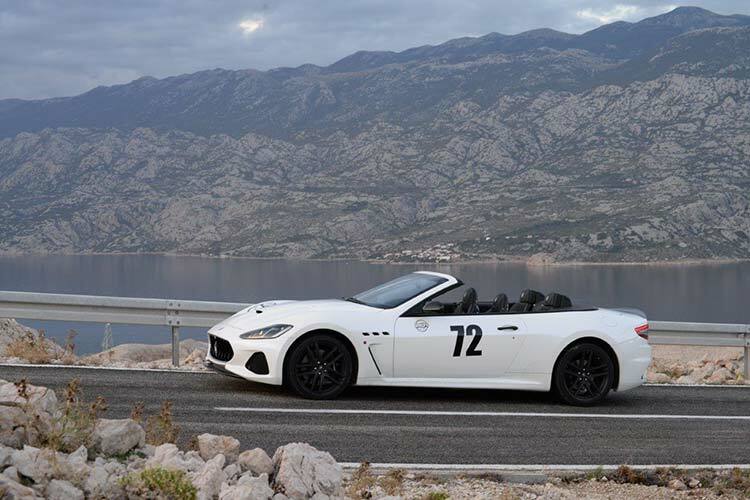 The Maserati GranCabrio MC, which stands for Maserati Corse. Little did I know that the car was so fresh in production that the license plates were Maserati’s own. That you can see on the picture and we made sure this exclusive drive was something to remember. 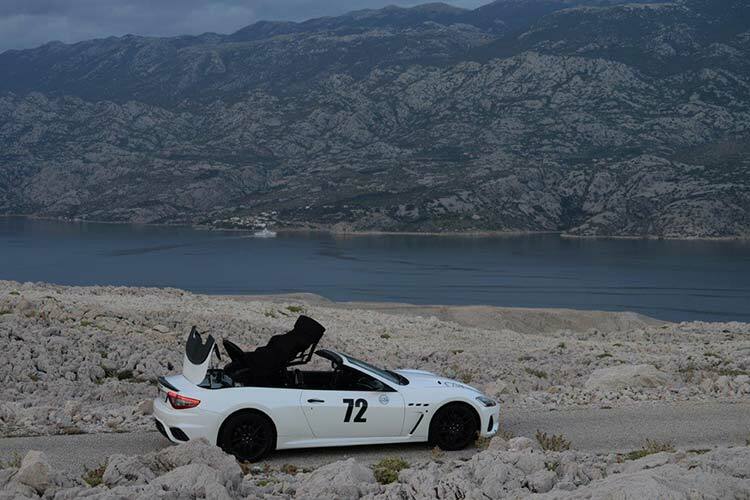 As we detached ourselves from the group of other supercars on the event, we found a moon like surface on one of the Croatian islands and explored the possibilities this grandtourer offers. Ride comfort and spaciousness come to mind first, resulting in an almost rejuvenating experience. 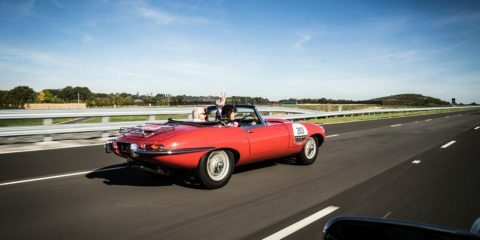 We have already determined that the way to drive it is with the roof down, no matter the weather, yet still, don’t expect the folding mechanism to perform its ballet while driving. There is one small piece of very relevant information, which makes this two tone structure able and agile on the perfect black asphalt roads of the island Pag. A transaxle layout, meaning the ZF six-speed transmission hinges between the rear wheels. The result is a superbly balanced front to rear weight distribution of 49:51. As I accelerate from another curve, being the only car by far, I almost feel compassionate for the potential bystanders, onlookers or curious minds alike. It is an event, even a spectacle, that this car is to look at and even more, to hear. You see, the V8 in its classical 90 degree V-shaped layout features a cross-plane crankshaft, not unlike in Maranello where it is flat-plane. This gives it one of the most exhilarating engine sounds in the industry today. But as our model is not a standard Sport but rather an MC there is more to be said about the sound deafening experience. The 460 hp derived from this 4,7 liter wet sump construction, will pass the first mark in less than five seconds. The Brembo rotors of 360 mm diameter in association with Pirelli P Zero rubber make it stop with confidence. GranCabrio has one of the last large volume atmospheric engines and another episode comes to my mind, year 1972. The last year before the oil crisis. An affair that made people think like they never have before. A pattern we are experiencing this very moment. Hearing a Maserati roar is almost like regaining your freedom. So how does an MC do that? It has mini-scaled silencers compared to the standard car, positioned higher up the exhaust pipes. Once you press a Sport button, the operating valve allows the escaping gases to bypass these sound barriers while generating less back pressure. What fills the air after is a tale for car aficionados to be. I call this car a tribute to living, to years before the world crisis entered our everyday vocabulary. If you can think of a better number to stripe the sides on a supercar rally, please speak now. But don’t tell Davide we are willing to take any number he offers for the next drive.